"ABC No Rio is a collectively-run center for art and activism. We are known internationally as a venue for oppositional culture. 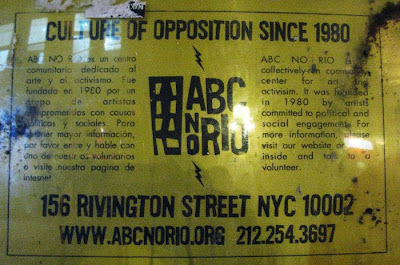 ABC No Rio was founded in 1980 by artists committed to political and social engagement and we retain these values to the present. We seek to facilitate cross-pollination between artists and activists. ABC No Rio is a place where people share resources and ideas to impact society, culture, and community. We believe that art and activism should be for everyone, not just the professionals, experts, and cognoscenti. Our dream is a cadres of actively aware artists and artfully aware activists. Our community is defined by a set of shared values and convictions. It is both a local and international community. It is a community committed to social justice, equality, anti-authoritarianism, autonomous action, collective processes, and to nurturing alternative structures and institutions operating on such principles. Our community includes artists and activists whose work promotes critical analysis and an expanded vision of possibility for our lives and the lives of our neighborhoods, cities, and societies. It includes punks who embrace the Do-It-Yourself ethos, express positive outrage, and reject corporate commercialism. 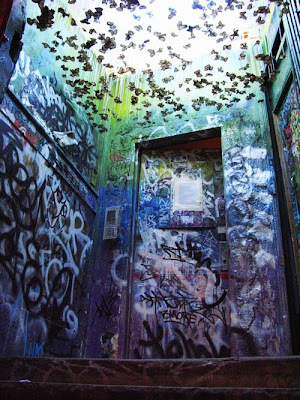 It includes nomads, squatters, fringe dwellers, and those among society's disenfrachised who find at ABC No Rio a place to be heard and valued."